Swimming pools….Owning one is terrific. But let’s not forget, they are dangerous! Each year, nationwide, more than 300 children under age 5 die and 2,000 more children visit hospital ER’s for submersion injuries. Many communities have enacted safety regulations governing residential swimming pools. 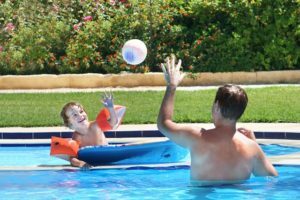 Apart from these laws, individuals can take their own precautions to reduce the chances of family pool or spa accidents. Install a fence or other barrier, such as a wall, completely around the pool. If the house is part of the barrier, the door from the house should be protected with an alarm or power safety cover. Vertical fence slats should be less the 4 inches apart and the fence should be at least 4 feet high. It should have not foot or handholds that could help a young child to climb it. Fence gates should be self-closing and self-latching.